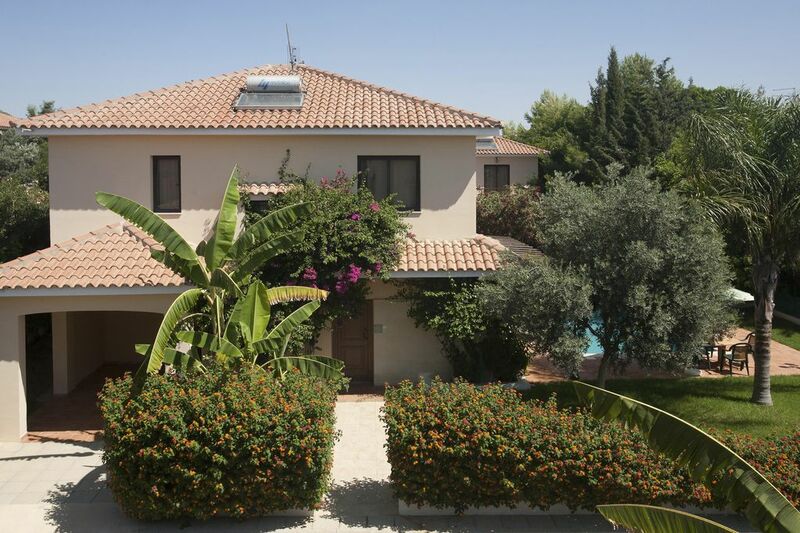 This lovely two storey detached Villa, has a private pool,,bbq,garden,private covered parking,offers free wifi internet access and shared tennis.It is of unique character and charm designed for the discerning individuals seeking five star quality and service. It is furnished and equipped to the highest possible standards.The rate include daily cleaning and maintenance of the pool,garbage collection,garden maintenance and weekly cleaning of the villa and change of linen.This villa is part of a resort of nine villas and staff are available all day for assistance and 24hrs for emergencies.The villas are situated among an oasis of olive, palm, banana trees and rose and jasmine bushes, in a quiet & tranquil area at the outskirts of Oroklini, 2 km from the sea. Access to the villas is restricted to residents and their guests only. Regina’s Exclusive Villas, all with private pools,garden,patio,bbq,parking,wi-fi internet,shared tennis,2km from the sea. Disc.for stays of more than 20 days.Early booking discount for 2019. The Villas are secluded in a tranquil area among an oasis of palm,banana,olive trees and rose & jasmine bushes with private roads and access to residents and their guests only.Also available for long term lets. The village itself which is within walking distance offers a range of shops, a supermarket, banks, chemist, bakeries, laundry & dry cleaners, gym,bowling. A caretaker and the owners live on the resort and are happy to assist their guests. Regina’s Exclusive Villas are licensed by the CTO & owned & managed by John & Regina Xydas & their daughter Sylvia. The owners & some of the staff live on the premises & are ready to assist their clients at all times. John,(Cypriot) Regina (French), met in the U.K whilst studying Hotel management. In 1979 after getting married they returned to Cyprus. Regina abandoned her career to bring up the family and John for almost thirty years was a general manager of some of the leading 4 & 5 star hotels in Cyprus. He also held honorary posts in professional & trade Associations, like vice-chairman of the Chamber of Commerce, Hotel Managers Association etc. In 2005 they started their business. Sylvia was educated in a private school in & studied Design in France. John & his family are well known in Cyprus and their name has always been associated with high professionalism, honesty, integrity and hard work. LOCATION: The location has been carefully chosen for its confined attributes privacy, access, services, amenities and aesthetics. Conveniently situated on the outskirts of Oroklini village with some stunning views to the countryside and the sea (2.5 km) in the background. They are situated in a secluded area with private road and access to residents and their guests only.Our GPS COORDINATES ARE: N 34.98622 E 33.65973. You can also find us on Google Earth. The village itself which is within walking distance offers a range of shops, including organic produce, supermarkets, banks, chemist, laundry & dry cleaners, bakery, gym, medical center and bowling. Some parts of the village have been restored to the original traditional style and boasts some fine rustic restaurants and bars..
LOCATION-BEACH: Oroklini public beach with some fine hotels is only five minutes away (2.5 km) and the center of Larnaca fifteen. The International Airport is 20, Ayia Napa and Nicosia can be reached within thirty minutes, Limassol 45 and the Troodos Mountains in an hour. When you have enough of lazing about in your own private pool and you fancy a dip in the sea “Oroklini Public Beach” is only a few minutes away by car (2.5 km). It is run by the local municipality and amenities like showers, changing rooms, coffee bar etc. are available. Umbrellas and sun beds can be obtained for as little as 3.00 euros per person for the whole day. Car hire, transfers, cruises, excursions can be arranged. Regina’s Exclusive Villas are licensed by the CTO and owned and managed by John & Regina Xydas and their daughter Sylvia. The owners and some of the staff live on the premises and are ready to assist their clients at all times John,(Cypriot) and Regina (French), met in the U.K whilst studying Hotel management. In 1979 after getting married they returned to Cyprus. Regina abandoned her career to bring up the family and John for almost thirty years was a general manager of some of the leading five and four star hotels in Cyprus. He also held various honorary posts in professional and trade Associations, like vice-chairman of the Chamber of Commerce, ,the Hotel Managers Association etc. In 2005 they started their own business. Sylvia was educated in a private English school in Cyprus and studied Graphic Design in France. She speaks perfectly English, French and Greek. John and his family are well known in Cyprus and their name has always been associated with high professionalism, honesty, integrity and hard work. It is a lovely resort,in a quiet area,renown for its personal service and attention to detail.Please also see our reviews from our guests. The villas are situated among an oasis of olive, palm, banana trees and rose and jasmine bushes, in a quiet & tranquil area at the outskirts of Oroklini, 2 km from the sea. Access to the villas is restricted to residents and their guests only.A tennis court and a children playground is available for our guests. Restaurants,take aways bars ,shops, banks,medical center, chemist, bakeries a gym,bus stop etc are within walking distance.Taxis are on call at your villa, You can find us on Google Earth on N 4.98622 E 33.65973. We are 2.5 km from the beach, Larnaca 10 minutes and Ayia Napa (Nissi Bay), Water Park is only 15 minutes away, Nicosia 25 minutes away. The nearest airport is Larnaca Airport which is 15 minutes away, (We are not on the flight path therefore do not get any noise at all). extra charge for A/C when used(optional)PAID LOCALLY. extra charge for A/C heating when used(optional)PAID LOCALLY. There are many water sports operating on the beech(2 km away) and they offer all the necessary gear. on side exclusive for our guests,free of charge. The villa is furnished and equipped to the highest possible standards and they feature: UPSTAIRS: Master double bedroom with en-suite bathroom,hairdryer & veranda overlooking the patio and pool. Two twin bedrooms, one with veranda overlooking the patio and pool, bathroom/ WC. All bedrooms have air conditioning/heating. GROUND FLOOR: Large Living dining room with satellite TV, CD/Radio, telephone, wi-fi internet access,safe (extra charge) with French windows opening onto veranda with patio & private pool. Fully equipped kitchen, guests WC. EXTERIOR: Partly covered veranda, patio, private pool, garden furniture, umbrellas and sun loungers, built BBQ covered car part & garden. The Royal Villas in addition feature a sauna,washing machine, DVD player, free wi-fi internet,stereo, hair dryer with beautiful views to mature and colourful gardens. Royal Villa guests receive a welcome gift.Royal villas are cleaned and change of linen twice a week. The Owner of the property, John, was fantastic to deal with from the point of booking and couldn't have been more helpful. The property was everything we hoped it would be, perfectly clean, very comfortable and in a great position. The pool was a piece of heaven, it was spotlessly clean and well maintained by the caretaker - Peter - who was on hand for any help we required. Both John and Peter made us so welcome and were on hand at anytime we wanted them but also left us the peace and privacy that makes a great holiday. We cannot fault the villa in every way, it had everything we would hope for to have a great holiday. The villa is in a lovely quiet, peaceful area yet only 5 mins walk from the shops, bars and restaurants of Oroklini. The beach is a 10 minute car ride away and the villa is also centrally located to easily get to Larnaca and Ayia Napa. John your warm welcome and hospitality was really appreciated and we can't thank you enough for ensuring we had a fantastic holiday in your lovely villa. Your caretaker, Peter, is a real star and we want to make a point of saying how great he was during our entire stay. It was a shame our stay flew by and we would loved to have stayed much longer. We hope to do that on our next trip. It has been our pleasure having you as our guests and we are honoured by your kindness and comments. My self,as the owner and professional hotelier it is my duty and responsibility to provide you with a comfortable accommodation complimented by personal service. The praise goes to Peter and the housekeeper who although they are staff they try their best to put and give the extra offer.A copy of your letter has been given to them as lovely comments like yours motivates then to dry harder.All we can promise you we will try next time to make it better. In the meantime we wish you all the very best until we see you again. The property was not at all as advertised. kitchen was terrible and very smelly, needs updating. When we arrived I felt like I walked into an empty house that was not finished. The room was very basic and looked run down. The kitchen was very smelly and all the pots and pans smelt terrible we could not even use them. There was supposed to be a washer which was upstairs infront of a shower which we were not able to use and if we wanted to use the washer we had to get an extension and run the plug across the landing and into the bedroom which was very dangerous. the bedrooms were ok but very basic and certainly not inviting. the toaster didn't work and there was no coffee machine as advertised. I did speak to the owner who did replace the toaster and a few other things, I felt as if the villa had been shut for months and he had just opened it got someone in to give it a quick wipe over and thats it all done. Whilst we were out in the garden we saw young people doing drug deals and sat right outside smoking drugs, not a place I would go with children. such a same as the villa is lovely it just needs bringing up to date. Our gardener was lovely a very nice person and very helpful at directing us to find the right places to visit. Few days before their arrival they requested complimentary late check out until 23.00 hrs.I replied saying that I could only offer them until 19.00 hrs as I had early arrivals the following morning and I had to bring in staff after their departure to prepare the villa,so I had to charge them for that.They did not even replied. I went to see them the following morning after their late arrival and they complained about the decor and furnishings of the villa.and everything else.I politely told them thet colors and styles are different for every person but if there was anything we could arrange in order to make their stay more enjoyable we where ready to arrange it.I inform them that we have many regular clients that request this villa time and time again. When I went to see them again they requested again com late check out until 19.00 hours which I offered them.As far as the other comments there simple explanation like the washing machine is in the bathroom upstairs so our guests can hang their clothes on the two large balconies and there no electrical points in the bathroom as it is not allowed by law. As a professional I was very sorry and upset to receive their review and all I am asking readers is to read all the excellent reviews we have on this property on homeaway and other sides.We have been on Homeaway more than ten years and this is the first poor review we had. soap I requested them to wash them again and change pots and pans,toaster with new ones. Absolutely beautiful :) Highly recommended! Gorgeous villa, made to feel so welcome, John the owner went over and above, helping us. People lovely and friendly, villa was amazing and pool was just what you needed to cool down. Villas set in a lovely location near to local bars and restaurants. Beautiful to sit beside pool at night (or swim). Would certainly recommend to anyone considering Cyprus, hopefully see John again in the near future. It has been our pleasure having you as our guests and looking after you.On behalf of everybody I would like to thank you for your kind comments and for recommending our resort to your friends.Such kind gestures motivate us to try harder.Our commitment to our many loyal guests is to make every stay better than the previous.We wish you all the very best and looking forward to see you soon. Kind Regards John and team. "It has been our pleasure having you as our guests and looking after you.On behalf of everybody I would like to thank you for your kind comments and for recommending our resort to your friends.Such kind gestures motivate us to try harder.Our commitment to our many loyal guests is to make every stay better than the previous.We wish you all the very best and looking forward to see you soon. Dear Lisa"It has been our pleasure having you as our guests and looking after you.On behalf of everybody I would like to thank you for your kind comments and for recommending our resort to your friends.Such kind gestures motivate us to try harder.Our commitment to our many loyal guests is to make every stay better than the previous.We wish you all the very best and looking forward to see you soon. A big thank you to John and everyone at Regina Villa's. We had a wonderful stay, everything was just perfect - very peaceful location, very safe, a few minutes drive/walk from all amenities eg supermarket, bakery, restaurants etc the villa itself was well taken care of, the pool was cleaned daily, a perfect family getaway. Everyone was extremely friendly and helpful. I would definitely recommend staying here, and will be back again! Thank you very much for your kind comments during your recent stay with us. It has been our pleasure having you as our guests and looking after you. Thank you for choosing Reginas Villas for your stay for the most important day of your life, your wedding, we wish you all the very best and happiness for the future. A copy of your letter has been passes to the staff as we find from experience that such lovely comments motivate them to try even harder. Hope to see you in the not to distant future. The village itself which is within walking distance offers a range of shops, a supermarket, banks, chemist, medical centre, laundry & dry cleaners, bakery, gym and bowling. Some parts of the village have been restored to the original traditional style and boost some fine rustic restaurants and bars. Special rates for long lets. Other Activities: ideally situated to explore every part of the island. Diving at the Zenobia Wreck as it is considered the best wreck diving site in the Mediterranean. If you are not a diver you can see the wreck from glass-bottom boats which depart from the Larnaka Marina and also enjoy lunch and drinks on board. Get the thrill of water sports which are offered on most Larnaka Beaches, such as banana, jet ski, paragliding, flyboard or even kitesurfing, windsurfing and sailing, as Larnaka has the ideal conditions for these kind of sports. Enjoy Larnaca countryside in an alternative way, by riding a camel in Mazotos Camel Park, a donkey in Dipotamos Donkey Farm of Skarinou or a horse in Drapia Farm of Kalavasos. Get crafty by joining a pottery session in one of Piyale Pashia's hidden workshops, in the old Larnaka area. Have an authentic fishing experience with the boat at Zygi village and learn the traditional fishing methods first-hand. Rejuvenate by experiencing Sea Yoga. This is yoga on the water with the use of Stand Up Paddle Boards (SUP). This activity can be performed in Pervolia or Mazotos beaches early in the morning. Have a Quad Bike Safari Adventure in the hills of Voroklini and Pyla and ride through various terrains on a four-wheel motorbike. Wine tasting at Ktima Dafermou in Lefkara or Ktima Christoudia in Kato Drys. Join a free guided walking tour of the city with a professional guide every Wednesday and Friday at 10 am, offered complimentary all year round.